The P1 Aquacross Team will answer any requests for rule clarifications or interpretations. Requests must be submitted in writing by the riders to the Series Administrator. Any prior verbal approval from P1 staff or officials without a written statement from the Series Administrator with regard to the interpretation of a rule or procedure will be deemed invalid. The intent of a specific rule will override a competitor’s interpretation of a rule. The intent of a rule will be determined by competent officials. 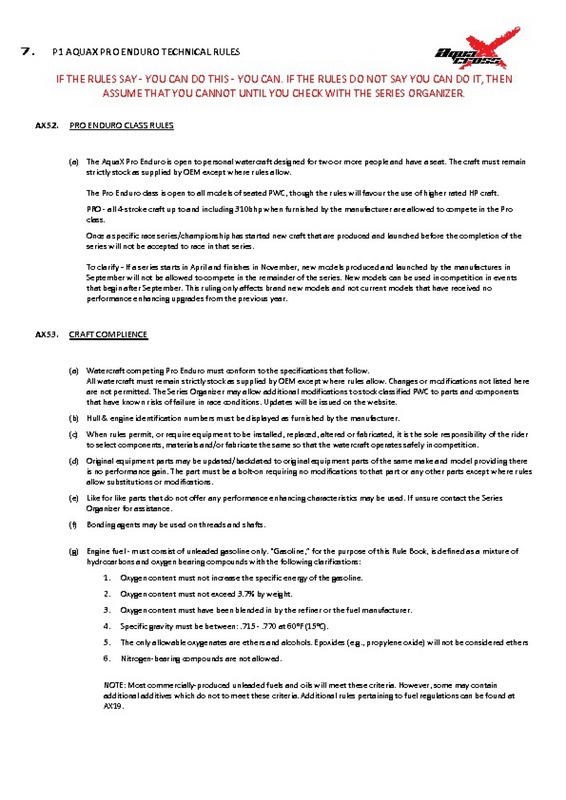 If any rule is unclear to the competitor, the competitor is advised to get written approval from the Series Administrator prior to any modifications. Please note: that while every effort has been made to write these rules in a clear and unambiguous fashion, it is impossible to anticipate every circumstance. It will be the Race Director’s responsibility to make decisions regarding rules enforcement. Any rule update/addendum to these rules will be posted here on the Aquacross website. Dear AquaX riders, thank you for participating in the 2019 AquaX Rules comment and suggestion survey. 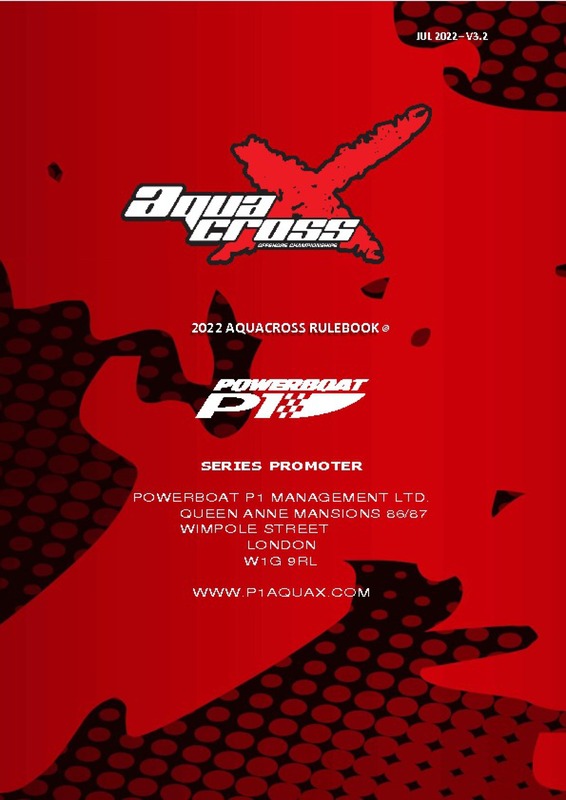 Your feedback is invaluable in shaping the continued development of the AquaX series. 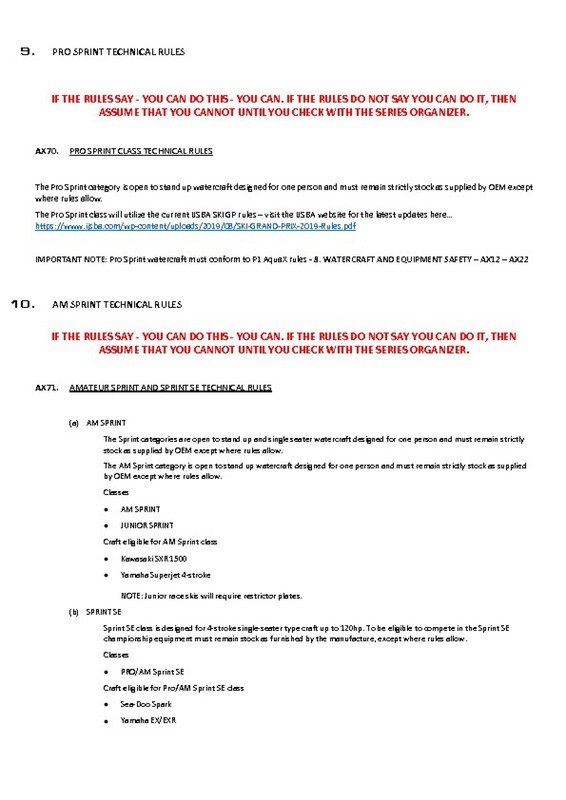 The 2019 rulebook is now ready for publication but for the purpose of ease, we have bullet pointed the main changes below and pulled out the tech rules for the specific classes. Full details can be found in the complete 2019 AquaX rulebook. Podium Attendance For the good of the sport and respect for your fellow racers, the top 3 finishers are required to attend the podium presentation, except in extenuating circumstances. Anyone not in attendance without prior approval will be DQ-ed from the entire event. Start Procedure Amateur Rookies - those wearing orange vests will be positioned on the outside of the class starting line. If a staggered start is used the Rookie 300hp riders may be positioned on the second row on the inside of the Am 200 class riders. Am Class Speed Limit Am 300 class speed limit has been increased to 70mph with a tolerance no greater than 2.5%. see rules for clarification. Seats Discarding seats during a race is reason for disqualification. Kawasaki Ultra 300/310 Additional mods permitted in both Pro and Am classes. See rulebook for clarification. Blow off Valve – All SC craft may utilise an aftermarket BOV.